Can you think of the best thing about cooking larger batches of tasty food at once? The leftovers. Notice, we said tasty food. Simmer, braise, bake or slow cook it right the first time and every reheating will be a delight. It is also nice to invest your time in “bulk” meals, because you only have to spend time cooking/stirring/tending once. And the biggest mess happens just once, then you can refrigerate or freeze the leftovers. Heat it up again and you have an (almost) instant meal on your plate, which is far better than opting for convenient fast food. If you have managed to eat all of your leftover pork carnitas or pulled pork, then congratulations, they must have been tasty! Now it is time to make another batch. Think big this time around. Next on the list, you’ll want to spend a little extra time to make the dressing by whipping up your own homemade mayonnaise. Use some now, save some for later – you never know when the craving will strike to dip your fresh veggies… As you are preparing the salad, feel free to sneak a nibble or two of pepper, onion, carrot or avocado. Just remember to save enough for others! 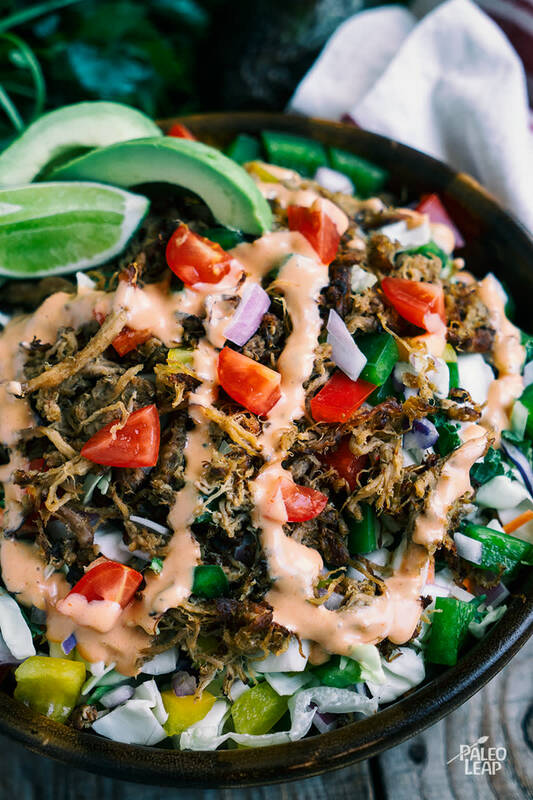 A meal in itself, this Southwest-style pulled pork salad needs no additional companion on the plate, though an occasional dessert of a sweet potato brownie never hurts. In a bowl combine all the ingredients for the dressing; season to taste and whisk until well emulsified. Reheat the pulled pork in a skillet over medium heat. In a salad bowl combine the cabbage, mixed greens, carrot, red onion, bell pepper, and toss gently. Top the salad with the pulled pork and sliced avocado. Drizzle the Southwest dressing on top and serve with fresh cilantro and lime slices.